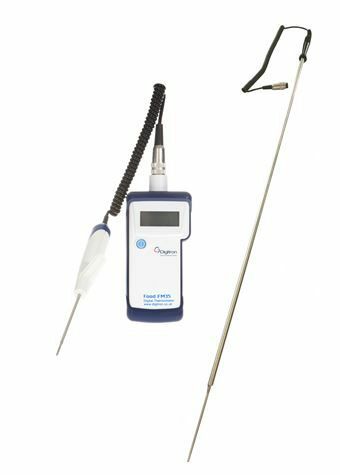 The Digitron Brewing Thermometer Kit is a simple to use Digital Hand-held Thermometer supplied with a General Purpose probe, 1m long Mash Probe and Calibration Certificate. The Mash Probe accurately records the temperature of the mash from within the mash tun to enable the body of the beer to be determined during the mashing process. As a craft brewer, you will understand how critical an accurate temperature measurement of this is. The Hand-Held FM35 Thermometer comes with a large LCD display, rubber boot and On/Off key and connects to both probes via a simple Lumberg plug. The hand-held's protective rubber boot can prevent accidental damage occurring such as being knocked or dropped. The FM35 Thermometer and the General Probe can also be used to monitor the core temperature of food that may also be served on your premises. Also, a customised length of the mashing probe is available on request.